Angelina Jolie and Jennifer Aniston seemed to stay away from each other at Sunday's Golden Globe Awards in Beverly Hills. The 42-year-old Angie beamed on the red carpet while the 48-year-old Jen skipped it altogether. And they did not appear to run into each other once in the ball room. But the after parties was a different story. Both A list actresses were at the Netflix shindig, though they were not seen together. Angie stayed close to son Pax, 14, while Aniston hobnobbed with the top brass at Netflix like Netflix Chief Content Officer, Ted Sarandos. Both ladies wore black, the color of the night. The women have both been wed to Brad Pitt. 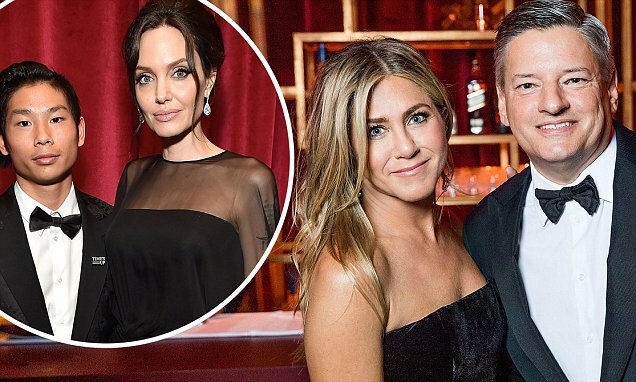 It was claimed that Angie stole Brad away from Jen, but sources have also said that the Friends star and the Troy hunk were already split before Mr And Mrs Smith was made over a decade ago. Inside the awards show, Jolie - who sat next to Pitt look-alike Chris Hemsworth - presented a gong during the evening as did Aniston. The duo rarely attend the same events but with both slated to be presenting there was higher chance for a run-in between the actresses. But Aniston, 48, chose to skip the red carpet, instead making an appearance on stage alongside Carol Burnett to present the award for Best Performance by an Actress in a Television Series - Musical or Comedy. It is unlikely the women will be seated near to one another however as Jenny Cooney, a member of the Hollywood Foreign Press Association - who helps work out the seating plan for the Golden Globes - recently revealed personal circumstances are taken into account when planning who will share a table at the glitzy ceremony.